There is nothing wrong with traditional pizza toppings. We’re big fans of the traditional combinations ourselves! The combination of red sauce, pepperoni, and mozzarella cheese is a classic for a reason: it’s delicious. That flavor combination isn’t going anywhere anytime soon, and you’ll find it on our pizza in Santa Fe, too. You’ll find other classic pizzas in Santa Fe on our menu, including the Margarita pizza, the Meat Treat and the Veggie. They are all incredible and packed with traditional pizza toppings. But they are not the only way to create a delicious pizza. 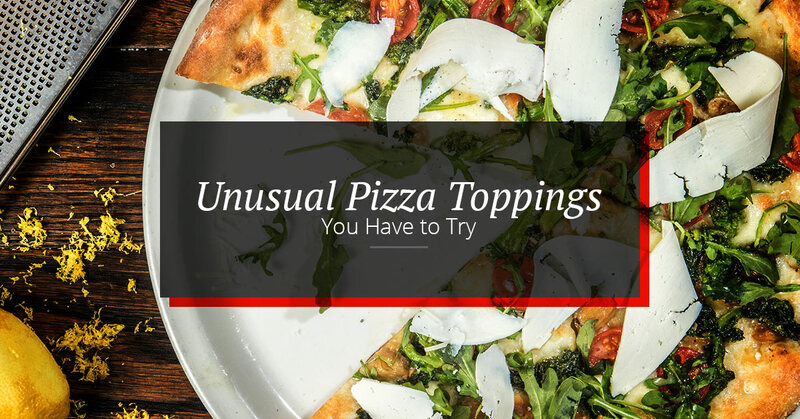 At Upper Crust we have some pizza toppings that might seem a little unusual, but give them a chance! You might find that they become your new favorite pizza flavors. In the mood to shake up your usual pizza toppings? Here are some that we recommend you try. Feta is a crumbly, salty, and slightly bitter cheese that’s absolutely delicious. It’s a great alternative to mozzarella cheese, or you can combine it with other cheese for the ultimate tasty blend. You’ll find feta on a lot of Greek dishes as well as many salads, where it pairs well with flavors like kalamata olives and spinach to bring a little zest to the dish. The cheese is made with sheep or goats milk, which is part of the reason is has such a bold and tangy flavor when compared to a cow’s milk cheese, such a mild cheddar. We use it on our Grecian Gourmet pizza, which has feta, kalamata olives, bell peppers, mushrooms, and fresh garlic. If you are looking for a pizza with a burst of flavor that doesn’t feel like it’s weighing you down, this is the one for you. Not all pizzas have to include red sauce! 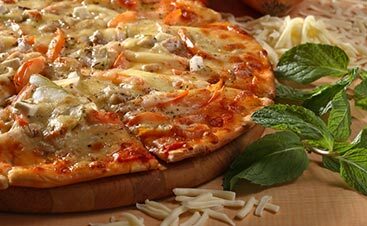 In fact, some of the best pizzas in the world shy away from the red and go for the green. Pesto is a sauce primarily made with basil and olive oil along with a mixture of pine nuts, grated cheese, and garlic. It seems like every chef has a different recipe for this green treat, but it’s hard to find a pesto that isn’t delicious. Pesto originated in Genoa, Italy in the 1500’s. 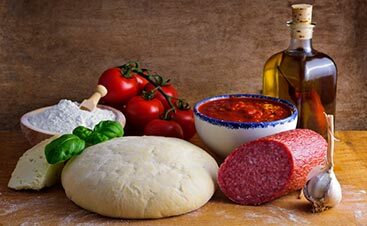 Thanks to it’s Italian origin, it’s no wonder that it’s a great way to start a pizza! It’s not spicy, but it packs a lot of flavors. We use pesto on our Sunny Chicken Pesto pizza. This one has pesto, fresh marinated chicken breast, and sun dried tomatoes. It’s delicious! Chorizo is a spicy sausage that’s used in a lot of Mexican and Spanish cooking. If you love meat on your pizza, you need to try it with chorizo. The pork sausage is packed with heat and spices that will make any pizza a little bolder. It’s tasty enough to stand on its own, though, so don’t feel like it has to be a part of your meat-heavy pizza. Chorizo gets a lot of it’s flavor from the smoked paprika and salt that’s used in its creation. We use this delicious pork sausage on our New Mex pizza. This one has Tortilla Flats red chile, shredded cheddar, onion, tomato, and chorizo. 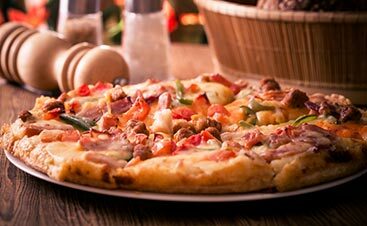 It’s a fusion of Italian pizza and Mexican flavors that you and your whole family are sure to love! How Are You Trying These New Flavors? You can try one or more of these unusual pizza toppings tonight at Upper Crust. Pick out one of our specialty pizzas or create your own! Choose from our huge selection of classic or specialty toppings and come up with a combination that everyone is sure to love. 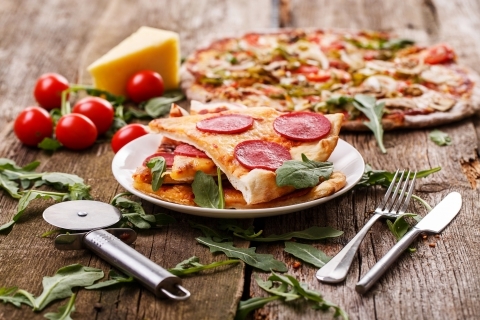 It’s a great way to shake up your weekly pizza run and try something new! Need some suggestions? Just ask our team. We’re always happy to help you find a flavor combination that keeps you coming back for more. Don’t forget that we offer delivery now, too, so you can enjoy these tasty new pizza toppings in the comfort of your own home. Just give us a call and place an order for the pizzas you need and we’ll have them to you in no time at all!